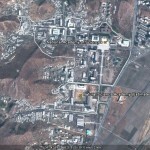 Pictured above (Google Earth): The National Academy of Science and what I believe is the Natural Science Academy (University of Natural Science) on the border of Pyongyang and Phyongsong. If any readers beleive the facility is in a different location, please let me know. See in Google Maps here. The University of Natural Science which is a North Korea’s science education university is located in Eunjunggu in Pyongyang. It used to be in Pyeongseong-si with the National Academy of Science, where the university is affiliated to, but it was moved to Pyongyang to benefit scientists as a citizen of Pyongyang. The National Academy of Science is North Korea’s best scientific research complex. Every year, Kim Il Sung University hosts a science competition in early January. The competition subjects include Mathematics, Physics, Chemistry and English and a thousand students who already passed previous competitions in local institutes participate in the final competition. Students who win first, second and third places in this competition are eligible to enter any Natural Science university of their choice. Also twenty to thirty top students are awarded and are given a chance to sit for an exam at Kim Il Sung University, The University of Natural Science or Kim Chaek University of Technology. However, the top students gets additional points in their admission, so virtually, seats for them are already secured. North Korea’s top talents usually choose between Kim Il Sung University and the University of Natural Science, but the formal is more for the social title and the latter is more for improving science research skills. The University of Natural Science, where North Korea’s science and technology talents receive full scholarship (including meals, clothes and even underwear) from the government, is affiliated to the National Academy of Science and is nurturing professional science researchers. The National Academy of Science is North Korea’s top scientific research complex, having the University of Natural Science as a branch. This University was established on 27 January 1967 by Kang Young Chang, the then director of the National Academy of Science and a member of the Central Committee of the Workers’ Party of Korea, and his determination to foster bright scientists. It was rather an unexpected move in the time when the environment variation theory (Lysenkoism- a theory that believes genetic abilities can be changed depending on the circumstance) that doesn’t admit the existence of the gifted was overflowing through the society as well as it was in other socialism countries like Eastern Europe and China. However, as a result of the establishment of the university, North Korea had a significant turning point in its science and technology development. The University of Natural Science started from Mathematics, Physics, Chemistry and Biology departments in Kim Il Sung University, and all of the professors were members of The Central Committee of the Workers’ Party of Korea. Furthermore, this university was financed by the ruling party’s finance and accounting department as its direct institution and was received special treatment until October 1985. Since then, it became a branch institution of the National Academy of Science, and has established its firm foothold as the top science educational university in North Korea up to now. Generally, in North Korea, which family one comes from or what kind of social background one has is more important than academic records, however, the ruling party’s Central Committee ordered to select students solely by their academic performance or excellence since 1984. Consequentially, the university has more students who just graduated from high schools, and famous for its young graduates’ scientific achievement after their graduation. Generally, the admission process is divided into two parts, and the first part is that the government sends the university’s professors to the high schools that are considered to be the best in each region, and give top thirty students who want to enter the University of Natural Science a pre-exam. The exam subjects are Mathematics and Physics and top five students are selected to proceed to the next part. In the second part, students take extra Mathematics and Physics exams specially set by the professors of the University of Natural Science in July to August which is the same time as the general university exams are conducted. Students who get ten out of ten in any of those extra exams are specially chosen even if their general exam scores are not as good. For the students who graduate early from high schools are only allowed to enter the University of Natural Science. It takes seven years to receive bachelor’s degree, the longest school system in North Korea and the graduates get the Expert Qualification which is only given to the natural science graduates from Kim Il Sung University while the graduates from other universities are given the Engineer Qualification. Especially, the University of Natural Science requires one to one and half years to finish graduate dissertation, and students conduct research at the research center at the Nationa Academy of Science. Thus it is the only university that has academic-industrial collaboration system which resembles that of South Korea. The graduates from the University of Natural Science can have chances to work at special government agencies such as the National Defense Commission, The Central Committee, Ministry of People’s Security and Ministry of State Inspection and also work as a professor at other universities. These incentives seem to attract more students year by year. Especially, it is confirmed that the graduates play the main role to develop strategic technologies such as missiles, nuclear technology and computer hacking. Recently, a company in South Korea advertised their newly developed Finger Key, a fingerprint recognition system operated by computer, so that people with registered fingerprints can only open the door. However, North Korea already received a gold medal from 22nd International Exhibition of Inventions of Geneva with the same technology in 1994, four years ahead of South Korea. NK has also developed a medical program that can diagnose people’s health by the computer-recognized picture of their faces. All these program development projects were led by the first graduates from the computer engineering department in the University of Natural Science. The GPS system which was the core technology in recent NK’s rocket launch was the work of software developers at the university, collaborating with China. A senior researcher at North Korea’s National Academy of Sciences has been arrested on espionage charges, it emerged on Tuesday. A high-level North Korean source quoted rumors that Kim So-in, who is believed to have been in charge of the North’s nuclear and missile development, and his family were arrested by the State Security Department and taken to the notorious Yodok concentration camp in May. A math prodigy who received his doctorate in his early 20s, Kim was said by the state media to have been behind the supposed launch of the North’s first satellite — an event widely believed to have been a long-range ballistic missile test. The source said Kim is accused of assisting his father Kim Song-il, a researcher at the Yongbyon Nuclear Complex, in delivering top secret documents on nuclear development to a foreign agency. The security department is nervous because many senior officials in various areas are suspected of attempting to earn dollars by selling confidential information, with top secret documents about the regime’s nuclear and missile development being leaked abroad, the source added. Pak Kyong-chol, an official in the Committee for the Peaceful Reunification of the Fatherland, has also recently been sent to a labor camp for spying, and Kim Won-bom, the chief of the Wonsan office of the North Korean military bureau in charge of earning hard currency, has been arrested after US$1.5 million was found at his home. And a senior official at the Kumgang bureau of the Majon Mine has been taken into custody for stashing away $100,000 after selling confidential information in conspiracy with military officers. Senior officials are trying to sell confidential information because of economic difficulties since the botched currency reform late last year and the Chinese government’s recent crackdown on drug and counterfeit dollar transactions. The security services have been ordered by regime heir Kim Jong-un to look out for “unusually rich” senior officials, the source added. He explained that some instability had occurred because price controls and other measures had not immediately followed the revaluation, and that “markets did not open for a few days [after the currency reform],” acknowledging that preparations for the measures had been insufficient. He also explained that following the currency reform, North Korean authorities had taken steps such as reducing prices on some foods and slashing unproductive expenditures. The government also encouraged women to take up jobs in light industry and in the service sector, and repaired the transport system. In an effort to develop the economy in 2010, the North Korean government boosted the budgets for the light industrial sector by 10.1 percent, and that of agriculture by 9.4 percent. Professor Ri went on to say that authorities had reduced the price of a kilogram of rice from 40 won to 24 won, had lowered the price of eggs to 8 won, and had cut the prices on cooking oil and soap, as well. He added that this trend will continue for the near future. The currency revaluation, the first of its kind since 1992, was aimed primarily at increasing the value of the North’s money and harnessing inflation, but despite the reform, the government is still managing foreign exchange rates. While keeping exchange rates under control, Ri stated that authorities could still adjust the value of the won, depending on economic developments as well as other domestic and international conditions. In both the APTN and Kyoto interviews, Professor Ri called foreign coverage of the North’s economic situation “exceptional,” and insisted that nothing was wrong with the DPRK economy. In order to meet the goal of building a ‘Strong and Prosperous Nation’ by the year 2012, North Korean authorities are reshuffling some positions within the Cabinet, which is its ‘Economic Headquarters’. During the first session of the 12th Supreme People’s Assembly (SPA) last April, Kim Jong Il launched his third regime, and now less than 6 months later, is restructuring the Cabinet. For example, the National Science and Technology Council, which was merged into the Cabinet Academy of Science (now the National Academy of Science) in 1998, has been re-established. North Korean media briefly reported on the 19th that the SPA Standing Committee brought out the “Democratic People’s Republic of Korea National Science and Technology Council” through the announcement of Government Ordinance # 301. The press did not follow up with specifics concerning the announcement, but the recent position of North Korean authorities that “without scientific and technological development, there is no independence, no national defense, and no economy,” it appears that the recent cabinet order is related to attempts by the North to strengthen its economy. The first National Science and Technology Council established in the North was created in 1962, and was intended to support the national defense industries. The Academy of Science, which had been established 10 years prior, was put under the control of the council, and the council was responsible for the creation and implementation of a national science and technology plan, as well as for providing guidance over research activities. However, as the North’s level of science and technology improved, the council, which was not made up of experts on science and technology, was unable to appropriately guide the research carried out by the academy. In 1982, the academy was separated from the council, and its status was boosted to that of an independent entity. North Korea is currently in its 3rd 5-year plan to “develop new national science and technologies” by 2012. Currently, North Korea is prioritizing the modernization of factories, enterprises and other industries, and Kim Jong Il has stressed modernization and the introduction of vanguard technologies during his on-site inspections of the nation’s economic facilities. Therefore, it appears that the newly established National Science and Technology Council will be responsible for overseeing cooperation between mechanical and chemical industries and the modernization of the industrial sector, while the National Academy of Science will focus purely on research. You are currently browsing the archives for the National Academy of Science category.